Call Time at the Audience Entrance is 4:30PM. Present your ticket with barcode upon entry. Cut-off time is at 5:30PM. Failure to arrive will disallow you to book for the next 3 months. Please be advised that taping schedules may change. You will receive a notification from KTX should there by any update on your booked schedule. 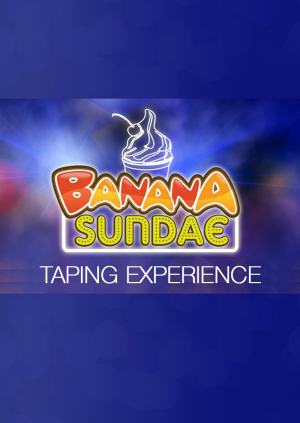 Banana Sundae (formerly Banana Split) is a Filipino comedy gag show broadcast on ABS-CBN every Sunday after ASAP and before Kapamilya Mega Blockbusters featuring Angelica Panganiban, Jason Gainza, and John Prats, with Pokwang, JC De Vera, Jessy Mendiola, Pooh, Zanjoe Marudo and Pinoy Big Brother: Teen Clash of 2010 2nd Big Placer Ryan Bang. 7. Failure to arrive will mean cancellation of ticket and disallow you to book for the next 3 months. If you will be unable to arrive, call 415-2272 dial 9 to cancel your ticket.